During the 2008 presidential campaign, Barack Obama often criticized George Bush's foreign policy toward many countries, including Iran, as "aggressive" or "cowboy." Almost immediately after taking office, the new President began an outreach program to various countries and entities in the Muslim world. He has made approaches to Iran, Syria, the non-existent "moderate elements" of the Taliban, and even Hamas. No one can accuse Obama of being aggressive or acting like a cowboy. Let's look at at the recent post-election protests in Iran and Obama's better-late-than-never condemnation of the regime's brutal crackdown on the demonstrators. 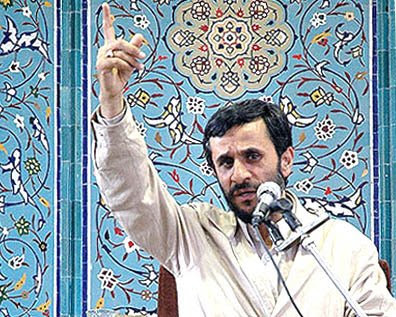 After President Obama stated that he was "appalled and outraged," Iranian President Mahmoud Ahmadinejad responded by accusing Obama of behaving just like George Bush. That had to hurt - being compared to an aggressive cowboy. That may have hurt more than the fact that American diplomats and attaches will not be hosting their Iranian counterparts for July 4th festivities. "Mr. Obama made a mistake to say those things ... our question is why he fell into this trap and said things that previously Bush used to say. Do you want to speak with this tone? If that is your stance then what is left to talk about? ... I hope you avoid interfering in Iran's affairs and express your regret in a way that the Iranian nation is informed of it." President Obama has said, correctly, that no apology is forthcoming. Iran is a country whose regime is the world's premier state sponsor of terrorism - they are the principal sponsors of Hamas and Islamic Jihad in Gaza, and of Hizballah in Lebanon. In Iraq, well over a hundred American troops have been killed by Iranian-supplied explosive devices. The country is almost certainly attempting to develop nuclear weapons and the missiles with which to deliver them. Its president has called for the destruction of the state of Israel, and in the last two weeks the regime has revealed itself to have almost no respect for human rights and political dissent. I would guess that given Ahmadinejad's retort, President Obama's hopes of engaging the Iranian regime has been dealt a severe blow. Let's review - Bush's aggressive cowboy policy did not work, and thus far Obama's kinder and gentler outreach approach has not worked. President, Obama, did you ever think that the problem with Iran might not be former President George Bush's policy? Perhaps the problem just might be the Iranian regime? As I have suggested in the past, PLEASE hire a competent Middle East advisor, then listen to him. Mish'al and Obama - talking past each other? The Awakening - IAEA and the real "axis of evil"
Iranian diplomats at July 4 parties - why not?